The painful heel is a common pain syndrome which can cause severe pain and can be incapacitating in most people. Severe pain in the inferior or posterior aspect of the heel is aggravated by weight bearing and the first step in the morning will be worse. Detailed examination of the foot is required to distinguish the differential diagnoses for heel pain. Achilles’ tendinopathy and plantar fasciitis are the two more common diagnoses for heel pain. Plantar fasciitis is a chronic inflammation of the plantar fascia in the foot. The main cause of this non-inflammatory tendinopathy is a mechanically induced irritation of the plantar fascia at the calcaneal insertion. The most commonly reported symptoms include pain at the first step in the morning and pain in the heel after or during exercise. Medial tubercle of the calcaneus on the inner side of the heel can be painful when a firm pressure is applied. Diagnostic imaging methods such as X-rays, magnetic resonance imaging (MRI) and ultrasonography for the ankle and foot may help to rule out certain soft tissue and bone pathologies. Stress fractures, tumours and calcium deposits need to be ruled out with imaging studies to determine the main cause of the heel pain. However, heel spurs may also present in asymptomatic patients. Patients who are obese, over the age of 30, and stand for long hours are at higher risk for plantar fasciitis. 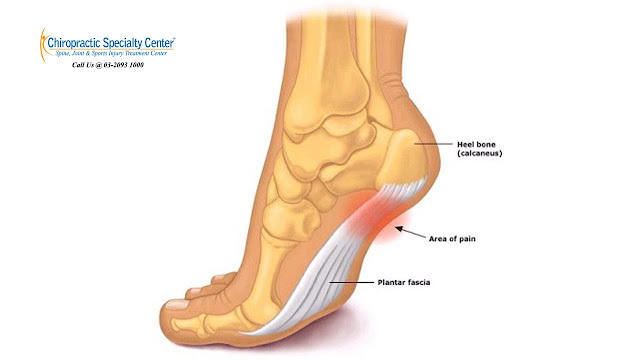 Structural and biomechanical factors such as pes cavus, flat foot and limited plantar flexion of the foot may also cause heel pain.